—These muffins are fabulous. I need to go out and get some more pears so I can make them again. —Your mom is right; I think these are the best muffins I have ever eaten. 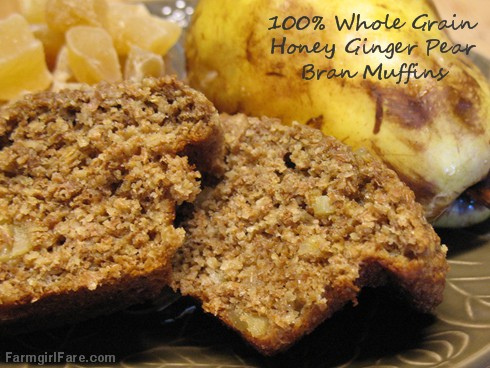 —I am sitting in my chair, drinking my coffee and eating this fabulous Ginger Pear Bran muffin! Excellent recipe and I loved the photo of the bruised and battered pear!!! —I just made these muffins and they are SOOOO DELICIOUS! The muffins are ginger-y good and so moist you don't need butter. Thanks, Farmgirl! —I've made these muffins four or five times now, with different variations, and they never cease to be a crowd pleaser. —These are the best muffins around. —I just tried this finally but I used pineapple instead of pear. I had no pears and I had no canned pears so I had some canned, in their own juice, pineapple and I subbed brown rice syrup for the honey. These are so good. Thanks for the excellent recipe. —I made these today. I didn't have quite enough pear so I added a 1/2 a finely chopped apple and subbed 2 T fresh grated ginger and about 1 T natural sugar for the candied ginger. A big hit with me, the roomie and our dinner guest (who was randomly noshing in my kitchen while I cooked). —I tried making them with oat bran only (increased soluble fiber) and agave nectar (low glycemic). I also added cinammon, cardamon and nutmeg. They are delicious and super healthy. —I love these muffins. The changes I made are: I used 3 cups of oat bran, used agave nectar instead of honey, and walnuts instead of ginger. Lower glycemic and delicious! —Wonderful muffins! I added a tsp of powdered ginger and used half molasses, half honey. Super yum. Thanks for a great recipe to play with. —Thank you thank you for such a scrumptious and healthy muffin recipe! I used half canned peaches and half canned pears (that my grandma canned), since I didn't have enough pears. I also didn't have enough honey, so I used 1/2 C. brown sugar plus 1/4 C. molasses. I can't tell you how many times I said "This is so GOOD!" while eating my first two. My husband probably thought I'd discovered gold. Thanks again! —I just found your site and this amazing pear muffin recipe and I am hooked! I used vanilla yogurt and added some cranberries and WOW! The best bran muffin I have ever eaten. Thanks! Can't survive on muffins alone? You'll find links to all my sweet and savory Less Fuss, More Flavor recipes in the Farmgirl Fare Recipe Index.